Let the grand adventure begin! As soon as Allison contacted me I knew this was going to be a magical wedding. Having designed her sisters wedding suite the year before, I knew Allison was going to be an absolute delight to create for as well. A warm spirited & outdoors loving couple they knew they wanted their suite to be whimsical, wonderfully inviting & inspired by their adventures in Colorado. 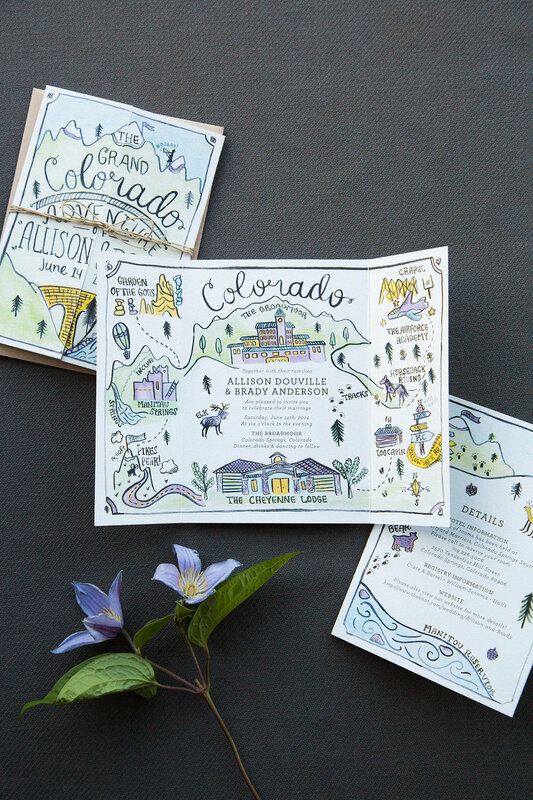 Their fold-out invitation includes a map of Colorado, highlighting the Broodmore hotel, the Garden of the Gods, Pikes Peak & The Airforce academy; all of which hold special memories & meaning for the couple. And lets not forget their guest gifts! They were bound Adventure Journals, for guests to record their own explorations & fun! Yay!